Work & Play: The Apple iPad For Travel? While on the road corporate travelers need to be able to access email, keep up with news and do research on the web, update and maintain websites and upload content to various platforms such as Flickr and Facebook. At first sight, the iPad appears to be the ideal on-the-go device for work and play. Supposed to be an in-between solution of notebook and smart phone, the iPad could free travelers from the need to haul books, magazines and newspapers on their trips. But it is far more than an eBook reader. There are several reasons travelers might like to carry this lightweight electronic equipment while they are on the road and experts look at the iPad as the next big thing for mobile computing. flipping through photos you have already transferred onto it from your regular laptop or desktop. With its enhanced Google Maps and built in compass the iPad will, according to Steve Jobs, make navigating a new city much easier while the wi-fi technology will allow tourists to download restaurant reviews on the move. The option of additions like a charging stand and an external keyboard could pretty much replace the need for a laptop. Although the iPad will be able to run any iPhone app right out the box, developers will no doubt customize their applications to take advantage of the large high-resolution screen. With its dimensions: 9.7″ display, 0.5″ thin and only 1.5 lbs. it is ideal for travel and to meet the new baggage restrictions. The most expensive model, priced at $849 USD includes 64 GB of memory and a pretty amazing battery life of about 10 hours and up to a month of standby time what beats the average netbook battery. Augmented reality apps become useless without a built-in camera which would furthermore enable video chatting. For travel bloggers and anyone else who likes sharing media with friends, this fact spreads immediate disappointment. Moreover, there is not enough hard drive space to run multiple programs at once and handle everything one desires to work on. The missing USB, SD card slot, VGA and HDMI makes the travel experience less sharable and could be a deal breaker for anyone looking to replace a laptop as it’s going to require a lot of accessories to give it extra functionality, meaning more weight in your pack. Well, finding advantages and disadvantages for purchasing the iPad in order to improve the travel experience has already been done by a couple of bloggers, journalists and experts. In fact, one should rather deal with the question whether and if so, in what way the iPad could influence the communication culture which also affects business travelers. As it is beyond all question that Apple has always been trying to launch products that are trendsetting, it might be, they did the same this time, being totally aware of these so called “missing features”. What if critics simply don’t understand that this new device might arouse the long overdue turnaround of today’s communication habits, contrary to “wisdom of the crowds” proclaimed by Jeff Jarvis? The end-user doesn’t always know what exactly he is in need of and has the desire to be given directions what to think, where to move and what to buy. Customers don’t always want to set preferences permanently, but be guided through the cloudiness of revolutionary products, rules and guidelines as well as technological restrictions. This is where path-breaking innovations get to make their move. Instead of growing complexity caused by even more detailed packages, users are craving for simplicity. The iPad is expected to reduce complexity on a large scale which could significantly change the entire culture of digital communication towards a minimalist result. In case the iPad replaces the laptop, as predicted by Steve Jobs and his followers, Apple’s delivered message is: communication becomes minimal. In order to prevent digital overload and loss of control, the simplification that comes along with this operating device could increase clarity, convenience and might even shape a virus free environment for its users. With this in mind, the iPad should not be seen as an in-between of laptop and iPhone but as a universal remote control for digital communication and networking in a future internet that’s likely to be less participatory than expected nowadays. Therefore we are ignoring the question as to whether or not to buy the iPad. There is no doubt though that the iPad will sooner or later change the way people view their media and that it is a valuable improvement to the early tries of other big players (Amazon, Sony, Barnes & Nobles). Unfortunately, it still seems to be inadequate for the mobile lifestyle of travelers. However, it is supposed to serve both business and leisure travelers on their journeys. Having worked in the field of mobile data applications myself back in the days when I was with Siemens I think it is great that today, approx. 15 years later, we have a number of capable devices such as Android, BlackBerry, Palm, iPhone, iPad out there so that every traveler on the move can find one that fits his needs. As an application developer you have the basic setup and can support your employees, users, clients, etc. in many ways wherever they are and whenever they need it or want it. Now there are no barriers to innovations and I’m looking forward to see our applications compared to others. This is exciting. Since Apple’s developer tool for the iPad has been launched recently the expected enhanced apps will be introduced to the app store very soon. As stated above, the iPad is not a standalone device but could, when using appropriate additions, replace the laptop as travelers major computing center. What Apple announced as a revolutionary new device in reality is a niche utility that seems to be practical for most travelers at this point in time. 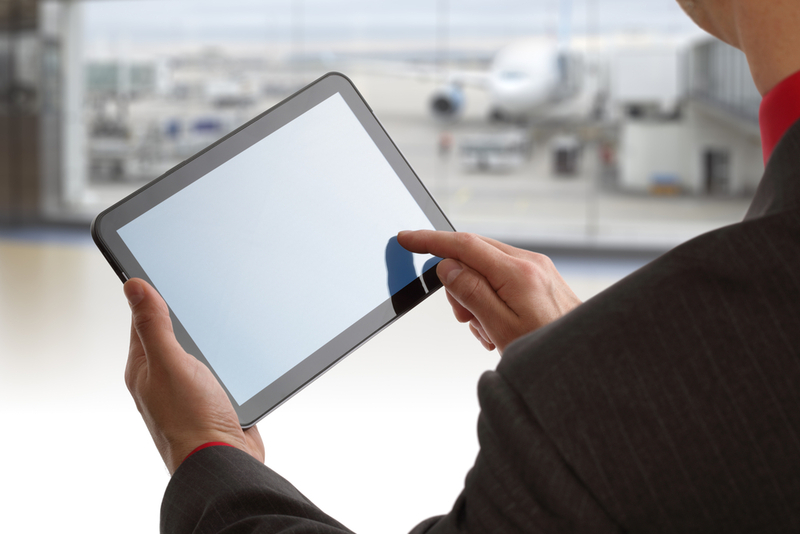 Therefore the majority remains skeptical of whether the iPad satisfies business travelers’ mobile computing needs and leisure travelers desire to share their travel experiences – at least so far. Waiting for iPad 3G would probably be a good decision as these gaps might already be closed. We also might know if and in what way it is able to influence future communication, thus improving travel experiences significantly.